As another amazing fishing season starts to wind down for Chinook in the Tofino and Clayoquot Sound area, many anglers consider this the prime time for most other species of Saltwater gamefish. The reliable weather conditions in Tofino during September make most types of fishing in the area not only accessible, but very productive as well. 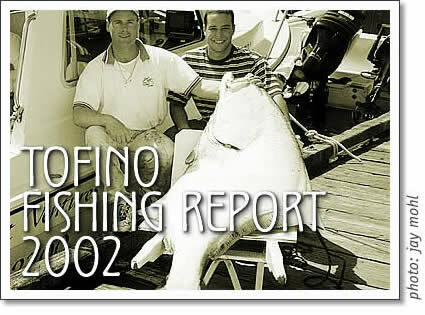 Tofino's offshore waters are still very productive for various bottomfish, with Ling Cod and Halibut preferring large Jigs like the 7oz Gibbs Minnow, or Mudrakers bounced along the bottom. With Coho Salmon returning to local waters in amazing numbers near shore, light tackle fishery undoubtedly offers some of the finest fishing action on the BC coast. Consider trolling with a mini flasher and a small spoon like the Gibbs Gypsy or small Super Diamond, as well as needlefish hoochies in shades of green. A fantastic light tackle fishery for Coho is with a live needlefish hooked through the nose with a #2 Gamakatsu and a slip weight. The action intensifies when multiple rods hook up with feisty Coho Salmon 15-20 ft under the boat. This time of the year is the Saltwater Fly fishermen's dream come true, with large, aggressive Salmon hitting most flies with a vengeance. Cast flies like the Chartruese Clayoquot Clouser or trolled Pink/Orange Buck tails will entice the true feeding characteristics of these great sport fish. Try Kutcous Pt., Chetarpe, or B.S. Pass with flooding tide the best. Tofino's fresh water opportunities are now coming into prime time, with local lakes and streams offering great action on Rainbow and Cutthroat Trout, and some great catch and release action on different Salmon species. Flies or spinners are the fall favorite, all rigged with a single barbless hook. For some absolutely phenomenal late season fishing, consider Tofino's various options for a weekend getaway.